The results, published in the journal PLOSONE, provide a new understanding of the musical factors that determine how easy or difficult it is to play a rhythm. In the app, there were three levels of difficulty - easy, medium and hard: 19 per cent of players (21,603 players) completed an entire performance of the piece without making a mistake at some level and 5 per cent (5,685 players) completed the game at the hardest level. For completed games, average accuracy was 91 per cent at the hard level, 84 per cent at the medium level and 78 per cent at the easy level. “We have shown that data collected from a game-based app can provide detailed empirical evidence of how pattern complexity influences ensemble rhythmic performance,” said Dr Marcus Pearce, the project’s senior author, also from the School of Electronic Engineering and Computer Science. Research paper: ‘What Makes Rhythms Hard to Perform? 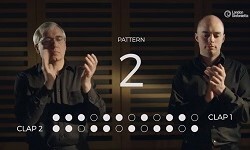 An Investigation Using Steve Reich’s Clapping Music. Sam Duffy, Marcus Pearce. PLOSONE. Study Computer Science at Queen Mary.